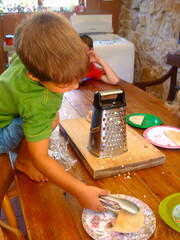 In the spirit of answering readers questions I recently wrote a post on Discipline, which led to a question on chores. And so, this week I thought I would respond to the question of chores and what I am hoping to achieve by giving our kids chores to do. Now chores is a word that can raise the hackles in any mother-child relationship. Needless to say, I tend to focus on getting the many jobs done out of necessity, but always in the back of my mind are a whole lot of practical life-skills that my children need to know. I tend to keep that word chores out of the mix other than to say we generally do chores in the morning before breakfast (get them done so that we can eat) and again before supper (again getting them done so that we can eat). Food is our great motivator!!! I prefer to think of chores as essential jobs for the smooth running of our home and the mastering of life-skills they will need to function in their own homes one day. 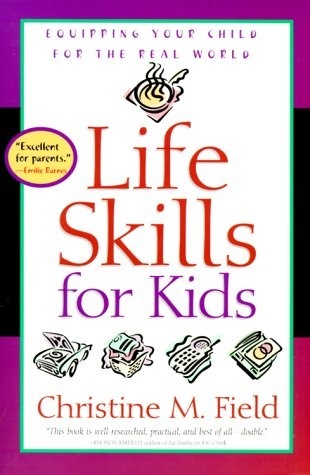 My favorite Life-Skills book of all time, and chores are way up there on the list of life skills, is this one by Christine Field. Nothing beats the work ethic of an eighteen month old – nothing!!! Not to mention they have boundless supplies of energy. They want to fetch and carry, they want to wash dishes they want to do all sorts of things!!! In order to keep them happy I give my little guys lots of jobs. Jobs that are easy for them to achieve and jobs they can do along side me. 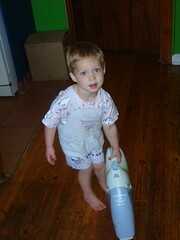 This brings to mind age appropriate chores – there is no point in giving an eager child a job they cannot do. But as a mom, the time spent with our kids gives us the tools to know what they can and can’t achieve. As our kids get older so their job repertoire and my expectations grow. Most jobs are surprisingly achievable if your kids know what you expect. “Tidy this room!” Actually means tidy every toy away where it belongs, not just out of site!, get clothes where they belong – into drawers, onto hooks, into the washer; and toss paper scraps and eclectic garbage into the appropriate bins. There is no point in saying clean the bathroom if you don’t show them how to clean it first. They need to know what the steps are and they need to know how to achieve them. Providing your kids with jobs is not just to get them to do the work so that you can rest on your laurels (like you would!!!) but so that they can feel part of the team while everyone is doing their own jobs around them. A Great Self-Image: I have a couple of friends whose kids don’t do chores. They want their kids to have joyful childhood memories. Trouble is most of us get quite a kick (read joy) out of a job well done! There is nothing like work to make us feel worthy! Interestingly enough as our kids grow upwards and onwards they take pride in their achievement. Little people are proud to do little people jobs and older kids are proud to provide a meal on their own or wash the car. That doesn’t mean they like all the jobs they get given: One of the Hoods had to clean out their clutter the other day and amidst wails of agony, a fine job was done, sorted, cleaned, donated, repacked and they were really proud of the eventual achievement. I was impressed myself! Relationship Building: Nothing builds a relationship by spending time working alongside one another. I have really found when one of my kids is down and out, that by getting them to do a chore alongside me, I often find out the source of their troubles and we can talk it through. Asking directly seldom works but somehow when we are focusing on a task things pop out!!! I also mentioned in an earlier post on sibling rivalry that working alongside one another makes it really hard to stay mad at someone – in fact when they are working towards a common goal it is almost impossible to stay mad with each other! Dependability: I don’t do chore charts. There I have said it! There is no chart to remind me to make breakfast for the family, and they don’t have a chart to remind them of their essential tasks either! My kids need to know what their chores are, to remember them and know that the family is depending on them to get it done. If the laundry person hasn’t packed away the laundry at the end of the day, then the next person can not lay the table, then I can’t dish up their meal. They need to know and take cognizance of the fact that they are part of a team. Simply put, if they haven’t done their chores then the next person can’t do theirs. There is a domino effect and things do fall apart! Also I expect them to do their chores well. I do not intend to go and do them over when they are not looking! If I find that I am reinventing the wheel so to speak then I go back and re-teach! Clearly my expectations were not thoroughly understood!!! A Servant Heart: It is one thing for our kids to do chores because they have to, it is quite another to do them because they want to and even further along the achievement scale to do it because they see it is needed to be done. Needless to say I want our children to have the habit being helpful. Not to mention I want them to serve and do their chores with a happy heart. Don’t even think of doing a chore with a bad attitude because frankly for me then the chore isn’t done. And I will re-teach, in the nicest possible way!!! 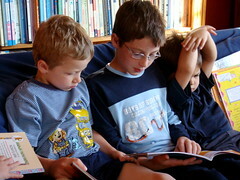 Just like they expect me to do my jobs cheerfully, I expect them to do theirs cheerfully – high expectations I know!!! They learn by example and I need to remember that at all times!!! How awful it would be if every time I did a load of laundry I cried out and lamented at the amount of clothing they wore – and let’s not mention the toilet!!! They need to perform their tasks eagerly and happily – it is part of having a servant heart. 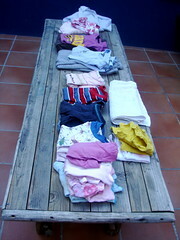 Life Skills: This is where I expect a lot from chores! People skills – working together; time management skills – getting the job done on time; space management – keeping their clutter and space under-control; environmental skills – taking care of the recycling and so on. I think growing up with a couple of real skills under their belt: home maintenance, car maintenance, gardening skills and such like are “chores” that sometimes get forgotten in the name of unpacking the dishwasher and taking out the garbage. But in running a household and living with other adults these skills are absolutely essential! There is not much use in owning a car if you don’t know how to change a tyre! 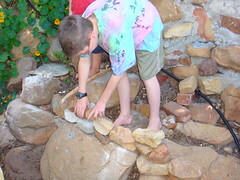 These are the kinds of chores my kids love and adore. Luckily! And we have worked hard to teach them well!!! There is no reason on this earth for me to change a tyre if I have able bodied mechanics ready and eager. Self-Sufficiency and Responsibility: The most obvious thing that one would want to achieve from chores is that our kids will eventually be able to leave home and keep house. They will take responsibility of their work, their time, their money, their commitments and all those things they need to keep under-control in order to function. I want my children to take responsibility of their possessions now so that they learn to look after them, long before their possessions are a house and a car! I want our children to behave responsibly towards their friends, thinking of them, writing to them and so on, before they have a family and kids of their own to be responsible for. I find responsibility is a hard lesson to teach – I want to do everything for my kids – but I know I am not doing them any favors… if they lose something, they must find it; if they break something, they must help to fix it or replace it; if they wrong someone then they must apologize. None of these are easy tasks but they need to be learnt just as well as mastering a load of laundry and the dishwasher! That’s it, that’s our take on chores. If you want to ask more specific questions about chores then feel free to ask in the comments and if I get enough questions I will make another chore post in the next little while. I loved this post on Chores. These are the things I have been doing with my children for years. I have three that are married and out of the home now and I believed they have really benefitted from doing chores! The bottom three are still working on learning all the benefits of doing chores, but it is well worth the effort. I have done quite a few “charts” in the past, but with the youngest one now eight, I too believe they can remember and do their chores correctly the first time. Chores are not a punishment! They are a gift to helping your kids become responsible adults. Chore charts just don’t cut it over here. They always fall apart after a week or so. I am laying down the LAW this fall. This is the last week of easy peasy life. They WILL take charge of their own belongings. Of this I PROMISE myself. Hi D, It is always good to hear from someone who is reaching the other side of the trenches – so to speak! I absolutely agree chores are not a punishment, they are a chance to master a skill and making them a punishment is well like extra math practice – a little detrimental to the anticipated enthusiasm!!!! You have a great weekend! Hi T, Thanks so much for commenting! I am totally useless at chore charts. The jobs have to be done, but the workers chop and change daily with whoever is available at the time – and everybody has to master each skill anyway!!! Also, after so many stars my kids are not going to get a special reward!!! Jobs need to be done, they are part of life – I think relevant praise for a job well done at the time is often a far more encouraging reward! I think if I had fewer kids they would probably do less – but as it is I know longer know who even owns what let alone where they stash it – but stash it they must! You have a great weekend! thanks for this and reminding me that chores are an essential part of life. I do see that taking responsibility is THE most important thing that parents can teach their children and those who don’t have to reap the consequences as well. I often am the recipient of children / young adults without a sense of responsibility and there is nothing as frustrating. Thanks I for commenting! Responsibility is really hard to teach for all us mothering types who want to step in and help our kids out of every pickle!!! But sometimes we have to step back and let them figure the solution out themselves!!! I remember a grade 1 teacher friend of mine who nearly went demented with kids whose parents still dressed them… She spent her entire life on toilet duty!!! She was so grateful to get kids who could do things for themselves!!! You have a great weekend! Yay! The post I’ve been waiting for…and you did not disappoint. Insightful and wise, especially that I don’t grumble on certain chores (guilty!). N questions as of yet, but let me stew on it for a bit. Thanks again! HI J, I just knew someone would ask this!!! I will pop a list of chores/life-skills into the next post… I hope you guys have a great weekend! Hi H, Glad to please!!! Aren’t we all guilty of grumbling over chores – did I mention the toilet!!! Stew away!!! And I will write a bit more next week… a list of chores for Julie K and maybe how to get kids to actually do them. You know while I have my feet up on the couch – not really (!!!) I am all about working alongside my kids, it makes the work of life more endurable for all of us!!! Hope you have a good weekend! Hay E, For most chores our kids don’t earn money because they are working as part of the family. But we do have a couple of extra tasks they can do, over and above their usual tasks, that they can do to earn money that they need for things they are saving for. I could probably write a post on this in the future!! !